Asbestos is general term that describes 6 naturally occurring silicate minerals, that have been used in many industries due to their highly desirable physical properties and reduced manufacturing costs. As a result of these cost-effective production costs (when compared to similar materials that were in place when it was introduced), materials containing asbestos were quickly adopted by the construction and automotive industries and used in large quantities. Aside from leading to Mesothelioma and lung cancer, asbestos exposure has been known to lead to asbestosis - a scarring of lung tissue. By comparison, Mesothelioma is a rare form of cancer that affects the lungs and abdomen. If you or a loved one has developed cancer that has been traced to asbestos exposure, we can help. With hundreds of millions of dollars in compensation for our clients, our asbestos injury lawyers have the knowledge and resources to handle your injury litigation. To learn more, call us today at (865) 247-0080 or simply fill out the complimentary "Free Case Review" form to the right - it's free to send and strictly confidential. In 1989, the Environmental Protection Agency (EPA) banned most asbestos-based products due to the health problems that it causes. However, asbestos is still present in many old structures, where it poses a health risk to construction and maintenance workers. An additional victim that is often not considered are the children and family members of those that have been exposed to asbestos. Quite often, the dust and fibers would stick to the clothing of workers, who would then bring that dust with them when they came home from work. As a result, many women and children passively inhaled the toxic dust, which then began to create this serious personal injury in their own bodies. Did Anyone Know About The Effects Of Asbestos? It has been acknowledged that asbestos has been mined for hundreds of years - with the biggest mine being in Asbestos, Canada. However, the first instances of lung-related deaths involving workers that handled asbestos was in the early 1900's, when a London doctor named H. Montague Murray performed an autopsy on an asbestos factory worker who had died in 1899. His conclusion was that there was the presence of asbestos in the tissue of his lungs, and that in his professional opinion, due to the worker inhaling asbestos, it had contributed to his death - if not causing it completely. The companies that actually manufactured, installed and sold asbestos products had knowledge dating back to the 1930s that asbestos exposure was dangerous. However, it wasn't until decades later that the manufacturers and contractors notified the public about the dangers of asbestos. Consequently, thousands of people across the county have unnecessarily developed mesothelioma, asbestosis and lung cancer. What Are The Costs For Legal Representation? 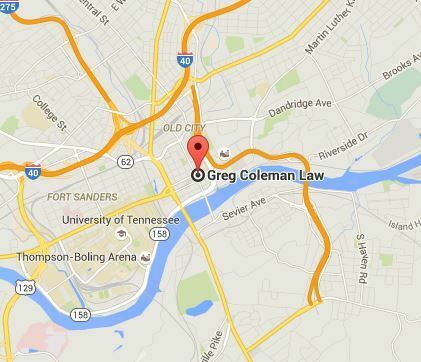 At the law offices of Greg Coleman Law, we believe that everyone should be allowed access to comprehensive legal representation. With this in mind, we proudly work on a contingency basis. What this means is that we only charge you for our fees and services if we obtain a settlement for you. To get started, we also offer a 100% free, initial case evaluation. This enables our intake team to collect the incident information from you, and to then have our team of attorneys review the details to determine if you have grounds to file a lawsuit - all at NO COST to you. If the decision is that you DO have a case, we can then advise you on the best way to move forward with proceedings. Asbestos-related diseases may appear up to 50 years after the initial exposure and every year, 10,000 people die of asbestos-related diseases. According to the Environmental Work Group, Tennessee ranks among the top 20 states with deaths due to asbestos-related diseases. If you or a loved one is suffering from asbestosis or Mesothelioma, it is important to contact experienced asbestos and Mesothelioma injury lawyers to guide you through the litigation process. You may be entitled to compensation for medical expenses and lost wages. If you or someone you know is suffering from an asbestos injury, contact our team on (865) 247-0080 and speak with one of our attorneys to discuss your legal options. Alternatively, to reach us online, simply click "here" and complete the complimentary "Case Evaluation" form. We will contact you shortly after receiving your inquiry.